TrustMovies: Henry Olek's SERVING UP RICHARD opens in New York and (soon) in L.A. Bon appétit! Henry Olek's SERVING UP RICHARD opens in New York and (soon) in L.A. Bon appétit! What makes a mini-budgeted indepen-dent film -- with no big names featured either in front of or behind the camera (the director, in fact, is a first-timer) -- work well enough to rivet an audience? Among other things, a tale that grabs you from its outset, followed by enough talent in the writing and direction depart-ments to pull it off, and finally strong enough performan-ces to bring the thing to life and maybe take your mind off a few of the longueurs that crop up along the way. SERVING UP RICHARD is one such movie, and it's a pleasant, if nasty, surprise. No matter how bizarre it becomes--very--the reality of the situation convinces. 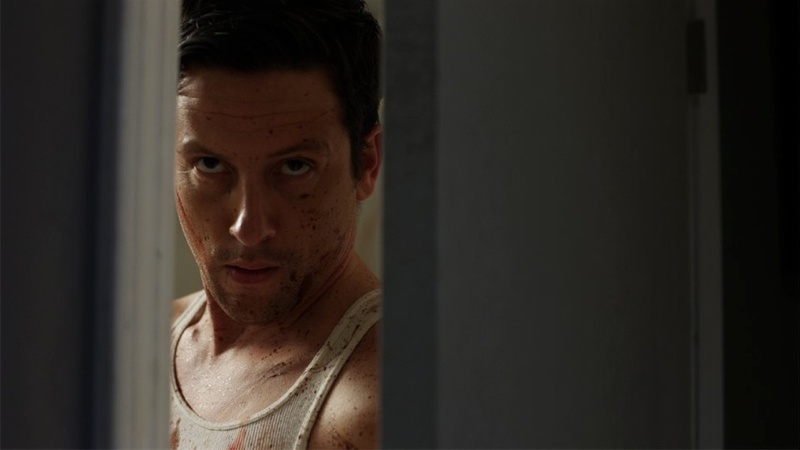 At the top of the acting heap is a fellow named Ross McCall (above, of Green Street Hooligans and a lot of TV), whom I don't recall noticing previously, but from now on I will. A visual combination of a younger Mickey Rourke and Matthew Broderick (if you can image that), he plays a mid-level Wall Streeter relocated to California, who should have listened to his wife's request regarding what kind of car these transplanted New Yorkers ought to buy. 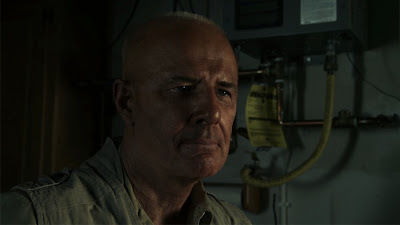 McCall, via Olek's screenplay, creates a character who is smart and savvy, if a little too sure of himself, and the actor's boundless energy and spirit, together with the horrific spot in which his character finds himself, makes us root for him quite thoroughly. The car sellers (who prove to be so much more) are played by Susan Priver (above) and Jude Ciccolella (below). Ms Priver also executive-produced the movie, so clearly she had the sense to back an intelligent property that also gave her a good and showy role -- the one of the three that is key in certain ways to everything that happens here. Mr. Ciccolella, the best-known of the three actors, handles his role with perfect aplomb. He's strong, smart and business-like. You don't mess with this guy, though McCall's character sure tries. The plot, which I won't go into for fear of spoilers, is tight and fast, with the exception of some of the mid-section, which I believe could lose a very few minutes without any problem. 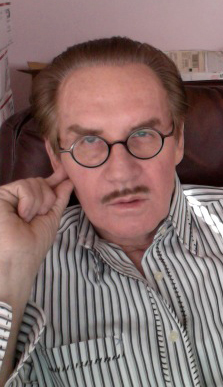 In thinking about the film, post-viewing, I suspect some of your initial objections will be easily explained away. Mine were, at least, when I thought about who these characters were, and why they did what they did. In trolling the web for photos and information earlier today, I discovered that the film initially went by a different name and was shown somewhere or other -- Britain, Canada, Australia, or New Zealand perhaps? 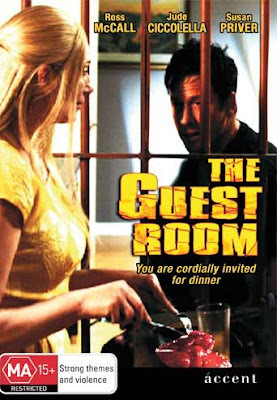 Wherever they have an MA-15+ rating -- under that name (The Guest Room, which I much prefer, for its charming irony, over the current title). Though I admit the poster, top, for that current title is much better -- simpler, juicier and more artful -- than the earlier version, shown above. 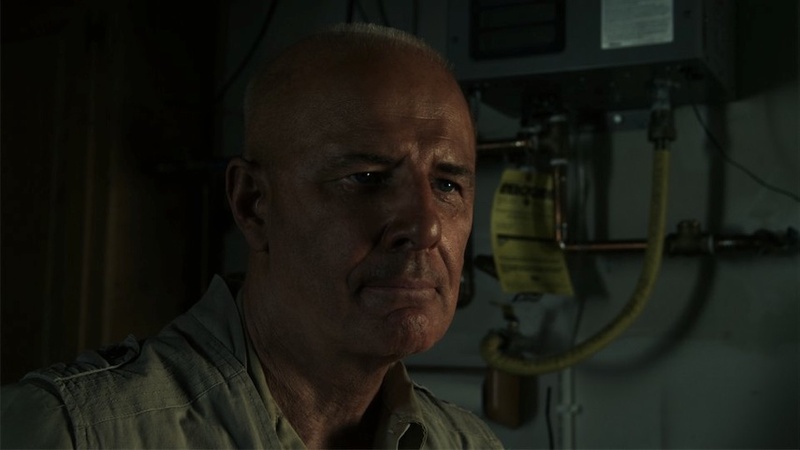 In any case, the movie itself is a fun ride and bodes well for a new career for Mr. Olek, even if, as I suspect, he may be easily be as old as I am. Good on ya, Henry -- keep it up! Serving Up Richard opens this coming Friday, September 7, in New York City at our indispensable Cinema Village, and then on Friday, September 21, in the Los Angeles area at one of the (also indispensable) Laemmle theaters, the Playhouse 7 in Pasadena.